As the VP of Development for SoftArtisans, Sam Haddad leads a team of developers to bring enterprise software to a global customer base. With a degree in Information Technology from Rochester Institute of Technology, Sam's expertise lies in .NET programming. In the past Sam has worked with both web and desktop applications, ranging from e-commerce sites to Office document processing tools. In this conversation, Sam discusses PowerPointWriter. Inserting online videos was one of the new key features Microsoft introduced in PowerPoint 2010. However, you really won't find the exact equivalent options in PowerPoint 2013 -- in fact, it has since been also removed from PowerPoint 2010! Fortunately you can still add online videos from YouTube to your PowerPoint 2013 slides by following a manual process. Connectors are essentially some of the shapes found within the Lines category of the Shapes gallery in PowerPoint 2013. To understand why only some of these lines can work as connectors, we first need to understand what a connector is. A connector is a line that creates a link that joins two shapes or any other slide objects to create a relationship. These connectors are linked to the slide objects they are connected -- this means that they move automatically when the linked objects are moved. That's the reason why they are called "Smart connectors" -- you'll learn more about all the other smart things these connectors do in subsequent tutorials of this series. When PowerPoint 2013 is launched, do you see an empty presentation with just one slide? This template influences the default look that PowerPoint provides -- the first slide typically has placeholders for the slide's title and subtitle. The text typed within these placeholders shows up in black over a white slide background. Although this default look works most of the time, you don't have to stick with these defaults. You can easily change the default look to something else -- for example, use your custom PowerPoint template or Theme as the default? Or even any of the other templates / Themes built within PowerPoint. When you create a new table in PowerPoint, you'll see some sort of default formatting applied to it. Most probably, you'll find that the table already has Banded rows and the Header row highlighted. While PowerPoint decides to turn on some of these Table Style Options, there are some that you can manually enable. All put together, you can play with 6 distinct Table Style Options that let you control the way through which table rows and/or columns can be made to stand apart. There are various fills that you can apply to the Plot Area of a chart -- and a texture can often work surprisingly well. For those who want to know what a texture is, it's essentially a picture that tiles across an area. We have explored other fills or chart Plot Areas, such as a solid color, a gradient, a picture, or a pattern. In this tutorial, we will explore texture fills. Patterns in PowerPoint are two-color designs that include lines, dots, dashes and checks. PowerPoint includes 48 such patterns with names such as 5%, plaid, weaves, shingle, and zigzag. Pattern fills can be particularly pleasing as a fill, especially if you use a simple pattern that comprises two subtle colors. You apply a pattern fill to the Plot Area of a chart in the same way as you would apply a solid color, a gradient, a picture, or a texture fill. Follow these steps to learn more. The Gap width within a chart is the space between two series points -- this by default is set to 150% of the width of individual Data Series (columns). Usually the gap width is automatically calculated based on the chart data and the Plot Area. The space between two series' points will be very narrow if there are many data series, or very wide when there are few data series. Even then, there is scope for some change in the gap width -- you can quickly increase or decrease this width. Microsoft Office 2010 was released on June 15, 2010. It is the successor of the previous version, Office 2007 and among the most used programs across the globe. However, after using the Office 2010 programs such as PowerPoint, Word, and Excel repeatedly -- there may be times when these Office 2010 applications face some serious issues such as crashes, corrupted files, etc. And in some scenarios you may not be able to run any Office 2010 application. At this state of time you may wish to perform some magical process that will resolve the issue. To make far reaching changes to your slides within PowerPoint 2003, you should always consider making these changes within the Slide Master rather than within individual slides - not only will this save you a load of time, but it will also make your slides look more consistent and professional. Slide Masters govern the several default attributes for your slides such as the slide background, font choices, colors, and even the positioning of the placeholders. In many ways thus, the Slide Masters are the backend workers of your presentation. And even though the Slide Masters in PowerPoint 2003 only include limited functionality, you can still use this functionality to either edit existing Slide Masters or even create your own Slide Master. 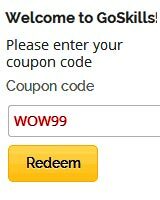 /coupon, and type in the coupon code WOW99. Get the GoSkills PowerPoint course now.